On Saturday, Veronica, Susanmi, Melissa and I explored the Sacred Valley. 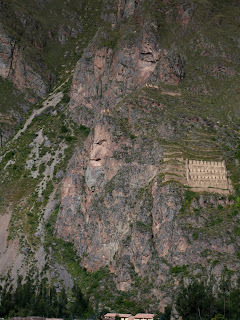 A truly powerful place, a man dressed in traditional and colorful wear serenaded the mountains with his flute playing in Pisac, where Inkan structures still stand strong. We walked among the mountains, in awe of their beauty. True to spontaneous Cusco weather, we saw both sun and rain. We walked among Inkan astrological viewing towers, religious and ceremonial areas, and irrigation systems- that still function, I might add! After Pisac, we took another bus to Ollantaytambo, which the guide books always describe as a town akin to a "desserted western town." It is pretty desserted and very dry, but we found ourselves a fabulous lunch. The trucha (fried fresh-water fish) was delicious: crispy on the outside, tender on the inside. Also, mixing light beer with coca cola is common here. Not bad. After Ollantaytambo, we took a combi (shared van- and I mean shared. Everyone gets really hunched, puzzle-pieced into one another, stooped over, and scrunched up.) to Urubamba. Urubamba is far more impressive than my pictures captured. After a steep walk up stairs upon stairs, the view is phenomenal. Susanmi pointed out the locations of different indigenous communities ("Just behind that mountain," she says) and told me about different Inkan legends. The formation to the right is said to be a jail. Well, either that or a pantry. Can you see the face in the mountain? 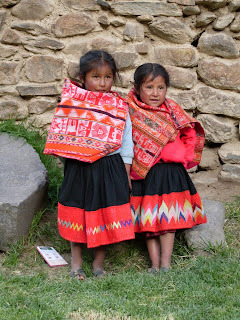 After the walk around Urubamba we took pictures of cute kids! 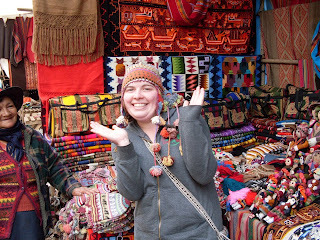 Next weekend I'm going to visit Moray and Chinchero. Everything is really huge. I can't quite fathom the greatness of the Inkas and all of their creations (physical and otherwise), how long they have lasted, that after years upon years they are still here for us to visit, admire, and respect. I think I'm going to pick up a book about Incan history. The internet just isn't cutting it. Something about curling up in my Barbie sheets and blankets with a book while the rain shouts at the roof and lightening crackles doesn't compare to reading articles online. We just had dinner and Americo is reading expressions in English and Melissa and I are repeating them in Spanish. This is great practice for all of us. Better get on it.